Dr. Michael Kanter's teaching emphasis is in sport management. NC State Online and Distance Education offers a variety of programs for students seeking to further their education and possibly advance in their career. More than 40 online master’s programs are available to students, including the Professional Master of Parks, Recreation, Tourism and Sport Management (PRTSM) program led by Dr. Michael Kanters, associate professor at the College of Natural Resources. The PRTSM online program was created by Kanters and other PRTSM faculty to offer a different approach to teaching and learning. They realized there was a need for a program aimed at working professionals. “The majority of our students have been out of school for at least a couple of years and are working in some capacity, full-time or part-time, in the parks, recreation, tourism and sports fields,” said Erin Adair, Instructional Technologist with the College of Natural Resources. In the fall of 2010, the Parks, Recreation, Tourism and Sport Management online master’s program was created. Adair joined the program in its second year. “One of the nice advantages of our program is that we waive the GRE if you have two years of full-time experience,” said Adair. A majority of the students who enroll in the program qualify for the waiver. Adair says the online program appeals to most students who are balancing careers and families. “Our students love their field and many of them join our program because they want to advance their career and move into a higher position, hoping to become a director or manager. Some of our students just have a passion for parks, recreation, sports or travel, and want to shift their career into that direction,” Adair said. Students enrolled in the program come from all over the country, including Washington, Texas and also the U.S. Virgin Islands. Adair says students who enroll in the PRTSM master’s program can expect interactive and focused courses. “We offer seven-week long accelerated classes, so students finish in a shorter amount of time and are never taking two classes at one time. Classes are a mix of synchronous and asynchronous assignments and activities. During the week, the students watch video lectures, participate in discussion boards, and complete various tasks,” Adair said. She says everyone comes together one night a week via electronic meeting, similar to a webinar. During that meeting, students participate in discussions and group work. The program has been successful and sustainable. “We hope to continue to offer our students challenging, engaging, and relevant courses as we grow our program by continually updating the quality of our materials, creating courses that reflect the demands of the real world and staying up to date with the latest educational technologies available,” Adair said. DELTA Testing Services will extend hours of operation and have additional testing locations during Spring 2019 finals. Here is an easy guide to help you find your assigned exam location. 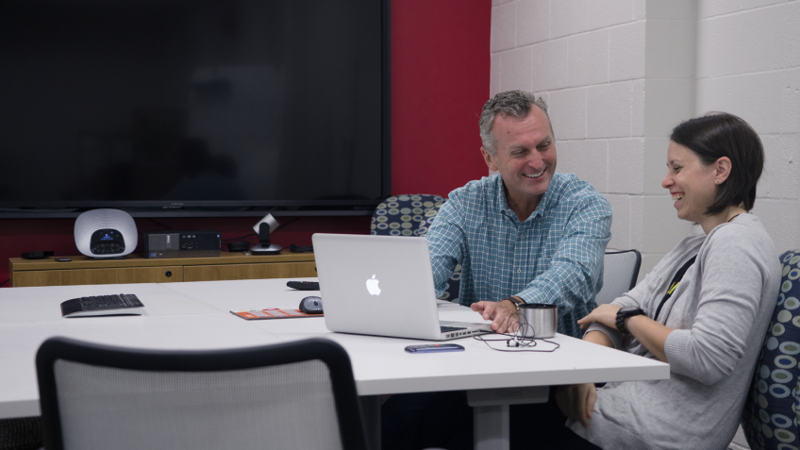 Online instruction at NC State is taking on a whole new meaning, thanks to emerging virtual reality technologies and the innovative folks at DELTA who adapt them for faculty and staff to use.